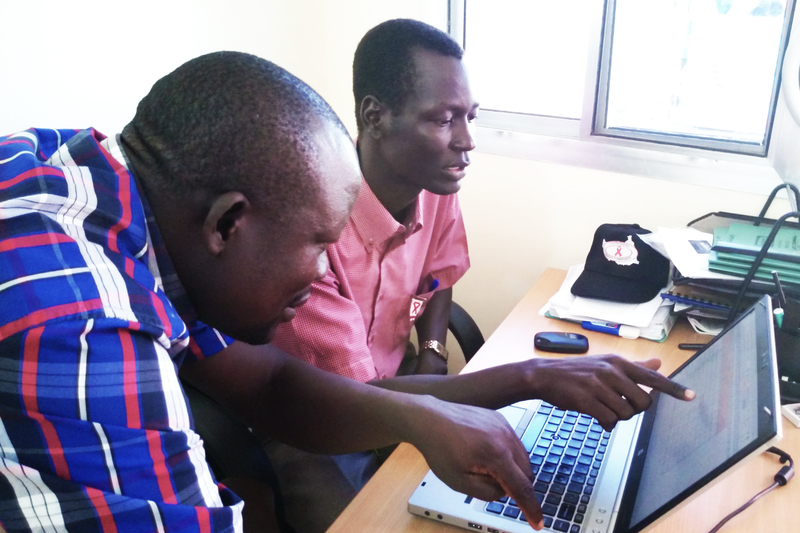 Acaga (left) mentors and coaches Ajak and gives him hands-on training on the key aspects of data collection, analysis, dissemination, storage, and coordination among partners. Photo courtesy of Riak Ajak Panther. Meet Riak Ajak Panther. He was born in 1989, part of the generation of children born during Sudan’s second civil war—the one that eventually broke the country in two and, in the process, drove some 20,000 boys from their homes as they tried to escape death or induction into the northern army. Eventually they came to be known as the Lost Boys of Sudan. They walked more than a thousand miles to Kakuma refugee camp in Kenya in search of safety and, in Ajak’s case, an education. Thousands of Lost Boys like Ajak never had the chance to return home. And he found it. Ajak worked hard to complete primary school and then secondary school before he had a chance to pursue his dream: studying health information management. He enrolled at Kenya Medical Training College and, in 2014, graduated with a diploma in medical records and health information technology. Thousands of Lost Boys like Ajak never had the chance to return home. As the war dragged on to 2005, many were resettled in the US. Ajak, though, managed to return in 2014. When he did, it was to what had become the world’s newest country, South Sudan. The long path Ajak started down as a boy in search of safety and knowledge finally led him to a job in South Sudan’s Ministry of Health. Through a highly competitive process, he was appointed monitoring and evaluation (M&E) officer for the HIV department of the ministry in November, 2014. Before Ajak joined the ministry, his department had no such officer, which meant that data on HIV in the country weren’t adequately collected, analyzed, disseminated, or stored. The ministry and its partners had no access to the type of HIV data that could guide their decision-making or mobilize resources for critical funding gaps. Now Ajak is working to change that. He works closely with IntraHealth International’s Acaga Taban Ismail, the strategic information manager seconded to the HIV department. Acaga mentors and coaches Ajak and gives him hands-on training on the key aspects of data collection, analysis, dissemination, storage, and coordination among partners. Ajak now manages the distribution of HIV data and reporting tools to health facilities through the state and county health departments, and partners with them to ensure facility data are captured using the approved ministry tools. He’s among the few M&E officers throughout the ministry to have these data management skills. Acaga mentors and coaches Ajak and gives hands-on training. The mentoring and coaching relationship Ajak and Acaga have formed not only builds Ajak’s skills and abilities—it also adds much-needed expertise to South Sudan’s Ministry of Health, ultimately strengthening the country’s health system. The data Ajak collects and manages will help government leaders to make timely, informed decisions about how to best address HIV in the country, including pinpointing the areas where health workers are needed most. Since taking the job in the ministry, Ajak has reunited with his family. His earnings have helped him to find a home in Juba City, and he lives there now with some of his family members, including several children who are about as old as he was when he had to leave home so many years ago. IntraHealth’s Strategic Information Project in South Sudan is funded by the US Centers for Disease Control and Prevention/ President’s Emergency Plan for AIDS Relief (PEPFAR). Before Ajak joined South Sudanâs Ministry of Health, his department had no monitoring and evaluation officer, which meant that data on HIV in the country werenât adequately collected, analyzed, disseminated, or stored. Photo courtesy of Riak Ajak Panther.